We’re humming along in the Gaal household. Actually, instead of humming we are talking about the Minions, which was Logan’s first movie in a movie theatre! Marty took him a couple of weeks ago and he loved it. He only got scared once and they had to leave for a little bit. Then I took him the following week and now every time we’re in the car he says, “Talk about the Minions, mommy” which means “Recite the entire movie, mommy.” We also had fun in the Asheville area the other weekend so Marty could do the Lake Logan Half. My dad has a cabin not too far away from part of the bike course so we rode his motorcycle out to catch Marty. He had a great day and I’m glad we got to cheer for him even if it was for just a few seconds. Logan had a good time, also, playing with the pool table (or as he would say, “can I go play with the water balls?”) – get it? Hahaha, Logan. They really do say funny things. We are also fully potty trained!! Wow, didn’t think that was ever going to happen. Training is still going pretty good. I’m feeling strong and….tired. Hopefully, I can finish off these last two races well. But getting into shape right now is not just for these races, it’s to build a base for next year because Marty and I signed up for, wait for it, The American TripleT. With friends, who coerced us to do it. If you haven’t heard of it, it’s an iron-distance over the course of a weekend. You start with a super sprint on Friday night, an Olympic Saturday morning, an Olympic Saturday evening, and you end with a half on Sunday morning. What have a I done? Caught him in between all the trees! 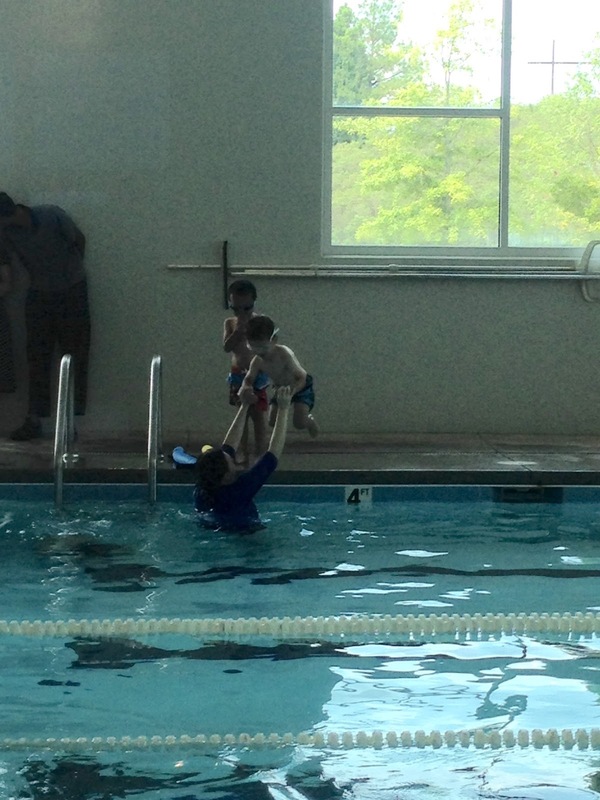 We're making some progress at his swim class. He wouldn't jump in for the longest time. When he's ready for something, he's ready. You can't really push this kid.